This is another useful presentation by Sami Ullah, the renowned civil engineer and the owner of civilglobal.com. In this video tutorial, he teaches you how to work out the cutting length of bent up bar in steel reinforcement. Bent-up bars are mostly utilized as shear reinforcement in beams and slabs. They facilitate to form the tensile reinforcement simultaneously they function as shear reinforcement. Now-a-days, the use of bent-up bars in flat slabs has been increased significantly. A bent-up is arranged to get the steel on the top at supports because bottom steel is not generally necessary at the supports. The main reinforcement in beams and slabs should have been bent up, ahead of the point at which it is no more essential to withstand bending. The bent up reinforcement should expand beyond that point, for a distance same as the effective depth of the member or 12 times the bar diameter whichever is larger apart from at simple supports or end of cantilever. To withstand negative bending moment that happens at the region of the support. To withstand shear force that is larger at the support. 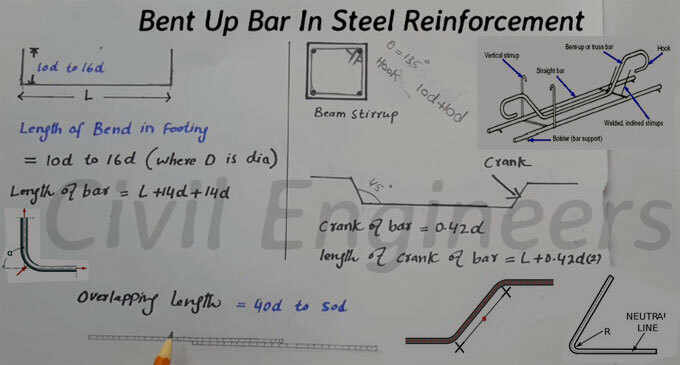 If the positions of bent up bars are not demonstrated in the drawing but it is essential to create a bar bending schedule then the position of crank may be considered as 1/4th to 1/5th of the effective span of a beam. In order to familiar with the detailed process, watch the following video tutorial.